Not long ago, Simmons Street in northeast Grand Rapids was tree-lined and beautiful. The maturing trees were just reaching the size at which their benefits—shade, character, increased property values, and more—were being realized when they were all cut down, leaving entire blocks naked. "I've talked to homeowners, and they say, 'We've lost the character of the neighborhood,'" says Joe Sulak, parks superintendent and city forester for the city of Grand Rapids. "And in the summer, it's hot. [Trees have] a lot to do with how you spend your time in your neighborhood and that livable quality of the environment around your house." Emerald Ash Borer samples and some of the damage they causeThough Sulak is the last person who would want to take that livable quality away from residents, his department removed trees. They had to; the ash trees, in the prime of their lives, were affected by the invasive species emerald ash borer, or EAB. Had the trees stayed, they would have died, quickly becoming a safety hazard to the neighborhood they'd so recently protected and beautified. Sadly, Simmons Street is no anomaly. 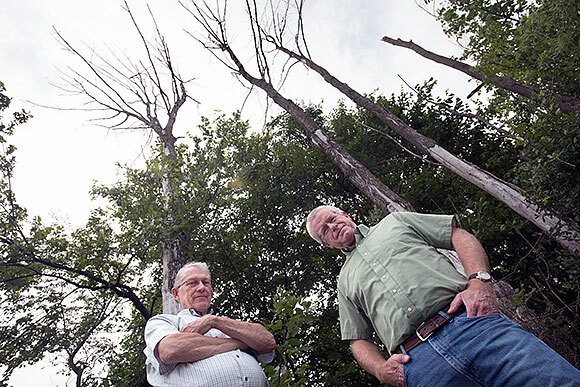 Before EAB arrived, Grand Rapids inventoried 8,500 ash trees on public land. Today, 1,400 are being treated, but the remaining ashes have either been removed, have died, or are expected to. As if the tree loss wasn't sad enough, it's pricy to remove all of those trees, especially when many are being replaced, as they were on Simmons. Sulak expects EAB to cost Grand Rapids $3 million. "All of this money comes out of the general fund," he says. "We compete with dollars for public safety, for code compliance for park improvement—anything that has to do with operating funds." And cost to the city is only one financial consequence of EAB. It will be years before the new trees grow large enough to lower residents' electricity bills by shading their homes, help to filter stormwater, and increase their property values. In the interim, residents will also miss out on the psychological and health benefits studies have proven street trees provide. And this is just one street in one city; the impact of EAB is being felt statewide. 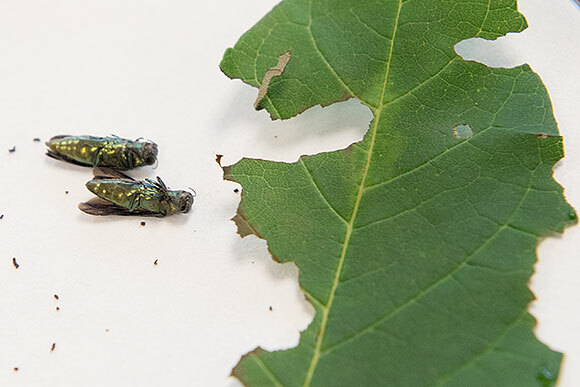 "The [invasive species] poster child for us in Michigan is emerald ash borer," says John Bedford, pest response program specialist for the Michigan Department of Agriculture and Rural Development's Pesticide and Plant Pest Management Division. "The cost to property owners, municipalities, utilities, is monstrous. There are dead ash trees everywhere." That's no exaggeration. In 2009, scientists estimated the total cost of EAB in North America by 2020 would be $12.5 billion—a number one of the study authors, Dr. Deborah McCullough of Michigan State University calls "almost assuredly an underestimation." At least an estimate is possible in the case of EAB. The total impact -- financially, culturally, and in terms of quality of life of invasive species on Michigan communities -- is inestimable. Hundreds of invasive species have taken hold in Michigan, from our forests to our skies to our waterways, in some cases permanently changing the ecology of an area. What we have lost to invasives is great, and crucial for Michigan residents to understand, as it is only by recognizing what we have lost that we will understand how important it is—to our state and to our local communities—to prevent further outbreaks. Here, we examine just some of the impacts invasive species have had on Michigan communities, as well as what we have learned from what we have lost. As EAB demonstrates, invasive species costs governments—and the taxpayers who fund them—big time. Consider the sea lamprey, the first known aquatic invasive species in the Great Lakes, which arrived back in the 1830s. The Great Lakes Fishery Commission, funded by both the U.S. and Canadian federal governments, spends $18 million a year controlling the pest. And it's that or we lose even more. "Sea lamprey come in…and they feed on our native lake trout," explains Sarah LeSage, aquatic invasive species program coordinator for the Water Resources Division of the Michigan Department of Environmental Quality. "They're really voracious. They've got this big, ugly sucker mouth that suctions onto the side of a fish and grinds into the flesh." 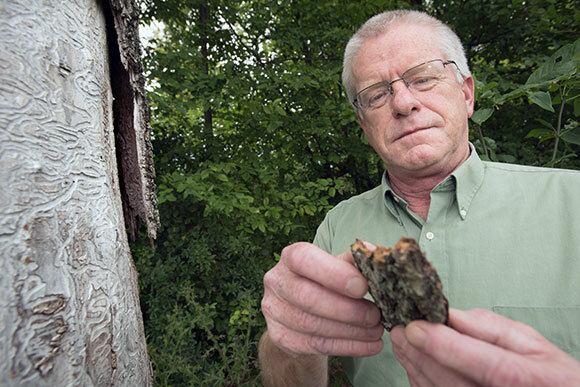 John Bedford looks over bark from a dead ash treeGross—and costly. A lack of sea lamprey controls would result in the disappearance or reduction of valuable lake trout sport fishing in the Great Lakes. And the lamprey is just one of more than 180 aquatic invasive species identified in the region. An Anderson Economic Group study found the annual cost to water treatment plants for controlling invasive zebra mussels to be $480,000 to $540,000, and for municipal water treatment facilities, zebra mussels create $353,000 in costs annually. From sea lamprey to zebra mussels to oak wilt, EAB, oak wilt and others, the costs for controlling invasives add up to a big price tag for tax payers. When all of those funds are being spent on controlling invasive species, residents aren't able to enjoy all of the municipal and state government services those dollars might otherwise have funded. But that's not the only way invasives negatively affects quality of life for Michigan residents. Have you noticed muck on your local beach? It could be because zebra mussels have over-filtered the water, altering the aquatic ecosystem and causing different flora to grow on the surface and wash up on land. Those same zebra mussels can cause hazards for swimmers, latch on to boating equipment, and more. Land-locked residents feel the impact in several ways as well. Garlic mustard eviscerates plant diversity in forests. The rare but noxious giant hogweed plant can land you in the hospital. More common, however, is the loss of positive health benefits of plants lost to invasives. One study estimated the health impact of increasing the number of trees on a city block by 11 was comparable earning $20,000 more a year and living in a neighborhood with $20,000 higher median income. "People have written about how the loss of ash trees have increased chronic human health conditions," Bedford says. "Yeah, you lose the tree, but then there are the spin-offs." Sarah LeSage with Eurasian Watermilfoil (invasive) in a Lansing lakeFor many, none of those spin-offs hit home quite like the monetary ones. And for private homeowners, the costs of dealing with EAB, garlic mustard, water milfoil, oak wilt, and other invasive species lands squarely on them. 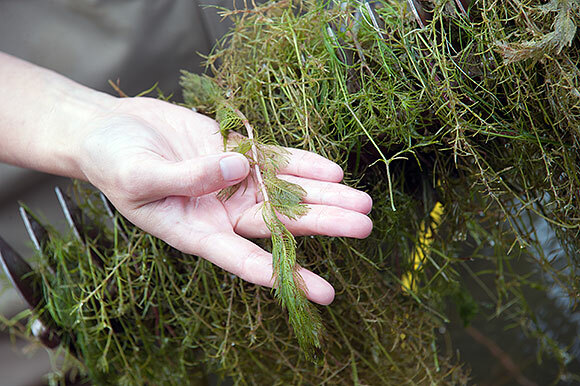 Anderson Economic Group estimates the costs of removing water milfoil to be between $1,040 and $26,000 per acre. Also a single power plant can spend $1.2 million monitoring and controlling zebra mussels, causing electric costs to rise. In neighborhoods with missing ash trees, utility bills rise even higher. "People notice that their water bills start to increase," Bedford says, "because a lawn that was once in the shade now requires more water to keep it going. Energy bills can increase because the air conditioners have to work harder." Tourism is a big deal in Michigan. The state's 113.4 million visitors in 2014 generated $37.8 billion in business sales and supported 326,685 jobs. Without tourism, found an Oxford Economics Company study, Michigan's 7.3 percent unemployment rate last year would have been 13.3 percent. The loss of millions of ash trees to EAB in camping and recreation areas, the threat to lake trout fishing by the sea lamprey, and the presence of zebra mussels on beaches are just some of the ways invasives threaten the tourism industry. Other industries are impacted as well. One industrial facility was found in the Anderson Economic Group study to spend $144,000 to $685,000 annually monitoring zebra mussels. A Lake Michigan paper plant spent $1.97 million removing 400 cubic yards of zebra mussels. Oak wilt negatively affects Michigan's $16.3 billion wood products industry. "The trees, when they die, are not good for timber products after a year or two," says Ronald Murray, unit manager for forest health, stewardship, and urban forestry with the Forest Service Division of DNR. "Red Oak is very valuable." Buy Locally. Many forest invasives get into the U.S. in wood packing materials like pallets. New regulations are in place to help the issue, but buying locally compounds the effort. Buying local trees and plant life is especially important to stop the spread of invasives that have taken root elsewhere and get imported into nurseries. A Pine Sawyer Beetle (similar to the invasive Asian Longhorn but non-invasive) found in a trapLeave recreational resources in place. "Don't move firewood" is a familiar refrain, and remains important—Asian longhorned beetle is now just four hours away in Ohio—but it's not the only thing to keep in mind when camping or fishing. Empty live wells and rise off boats and boat trailers before departing an area. Use all live bait where you purchased it. Pay attention. According to Murray, Asian longhorned beetle was discovered in Ohio when a woman noticed an odd insect on her picnic table and reported it. "The people who are so-called professionals like us, we only have two eyes a piece," says Murray. "We'd much rather have a false report than to miss [a new invasive.] The best thing the people can do is keep their eyes and ears open and to talk to their neighbors." Not sure what you're looking for? A number of resources exist to help, like emeraldashborer.info and the Midwest Invasive Species Information Network. Think about pathways. How might your actions introduce a non-native species into the environment? If you have an aquarium, your fish could disrupt the local ecosystem if released. Consider how your actions could become a pathway for invasives. While what Michigan communities have lost—and continue to lose—to invasive species is great, what we have to protect is still much greater. A better future begins before the next invasive becomes established. "The story that isn't as well told about invasive species is the value of prevention," says LeSage. "If we can prevent things from coming in, it's much more cost effective, or, if we catch them early, that's second best." This story is a part of a statewide Invasive Species Community Impact Series edited by Natalie Burg. Support for this series is provided by the Michigan Department of Natural Resources. Issue Media Group: A projection of EAB expansion through 2020 show costs would likely exceed $12.5 billion. Who is responsible for paying that price tag? McCullough: Yes, that is certainly accurate. And it's almost assuredly an underestimation. That's just the economic impact. That doesn't count ecologically any changes in forested areas that have a lots of ash trees. We estimated about 55percent [of ash trees] will die, and when you run those numbers…It was about 2009 when we did it and we actually under estimated where ash borer would be by 2015. So if you extrapolate, nothing's getting cheaper. So it has to be an underestimate. And the people who are bearing those costs fall into two big groups: private property owners and municipal government. IMG: Emerald ash borer is already the most destructive and costly forest insect to invade North America. Why is the reach of EAB so much greater than invasives of the past? McCullough: Partly because its' a tree killer. Gypsy moths used to be the baddest, most invasive forest insect…but gypsy moth caterpillars eat leaves. And that's the kind of damage most trees tolerate. Usually, trees don't die when they're defoliated. But once ash borer invests a tree—and it varies among species, as some are more vulnerable than others—but ash borer is a tree killer. And the truth is that nobody knows how many trees have been killed yet. For a while I tried to keep a tally in my head, but I've given that up. We just say hundreds of millions now. IMG: What has been the cultural impact of EAB? McCullough: The one that is really a sad story is the Native Americans in much of the lake states region in the northeast U.S…they have not just cultural but spiritual associations with black ash. With some of the tribes, their creation story involves the black ash. And black ash has really become the must vulnerable that we've been able to evaluate. They also make baskets out of it. We've had workshops where elders come in and [have told us] it's something that comes down through time, mothers pass it down, and if you're a basket-making family, that's your identity within the tribe. I don't know what to tell them. It's frustrating for me, but much more so for them. IMG: What lessons have we learned by studying the economic impact of EAB that can be applied to future invasive species threats? McCullough: There are a few things. One is the risk that is associated with bringing in material from overseas, particularly Asian countries. We do so much trade with China now, and it's not the commodities, but the wood crating and the wood pallets. We knew before that wood-boring beetles, those insects can be in that wood. Requirements have been toughened up to some degree and there is more emphasis on preventing the accidental introduction of these kinds of insects with that material, but it's not 100 percent. 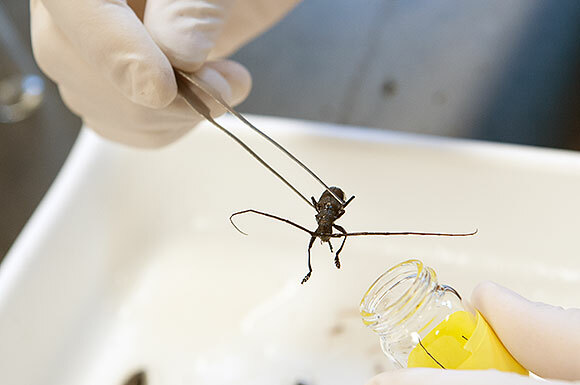 There's a lot of effort going on to make people aware of the whole invasive forest pests issue. Just getting people aware of the big, bad pests, what to do if they see an unusual insect or something that shouldn't be there. The third thing is…we kind of got smacked up side the head. We don't know a lot about the insects in China. In Europe, there's long history [of studying and publishing information about insects]. In China they don't have the same kind of history. For a long, long time, that information wasn't available. IMG: Knowing what we now know about the impacts of EAB, what can people and communities do to lessen the impact of the disease? McCullough: When we were first working on ash borer in 2004-2005, there weren't any really effective, systemic insecticides that you could apply, but now there are. Things have come a long way. If you have an ash tree that is relatively healthy, you can protect your own ash tree. There are places where ash borer is relatively new and there are places in Michigan where that ship sailed few year ago.